Formed in the summer of 1983 when Cevin Key and Nivek Ogre came into contact with each other, Skinny Puppy has been one of the cornerstones of industrial music. With such memorable and cutting edge albums as "Cleanse Fold and Manipulate" and "Vivisect VI", it is easy to see how Skinny Puppy's influence remains with us even today. The 1996 release of "The Process", Skinny Puppy's last album, left me both electrified and numb. The drug overdose on August 23, 1995 of long time member D.R. Goettel left fans shocked and saddened, the enigma that was Skinny Puppy had finally come to an end. In this final release, insanity and destruction are themes that reflect the turmoil that the band was going through near the end. Cascading in demonic chaos, the music wraps you in a death shroud and leaves you gasping for breath. The raw intensity and angry noise assault your brain like a masochistic ritual, leaving you both wanting more and needing desperately to escape. The driving rhythm of the opening track "Jahya" sets the stage and prepares you for what's to come. The classic insane vocals are represented in all thier glory on "Candle", one of my all time favorite Skinny Puppy songs. The haunting, introspective track "Cult" remains firmly lodged in your soul likea rusty nail inserted in an already infected wound. The title track "Process" is classic Skinny Puppy, taking us back to the days of "Bites" and "Rabies". The almost "dance club" track "Blue Serge" has a danceable beat and rounds out the cd nicely. 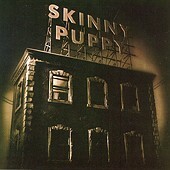 This cd represents the full power and energy of the Skinny Puppy legacy. Thanks for 13 years of great music and memories. For all the fans out there, remember who taught the killing game first.